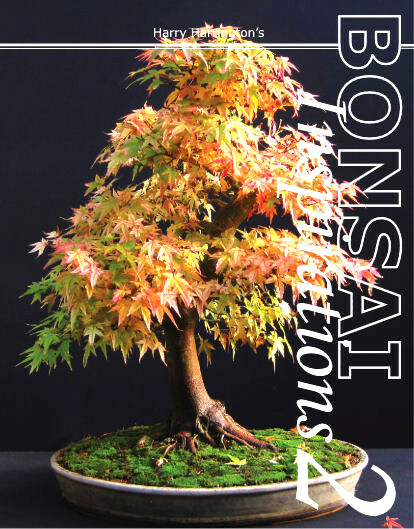 The English Language Edition of Bonsai Inspirations 2 is now available for Amazon's Kindle, PC's, Macs and Mobile Phones from Amazon directly. The Spanish Language Edition of Bonsai Inspirations 2 is now available for Amazon's Kindle, PC's, Macs and Mobile Phones from Amazon directly. explaining how to grow and improve your collection of trees is refreshing. again, Harry puts the approach of putting case studies at the center of the book. Somehow he manages to grow great trees from rather uninspiring material, and in the process of doing so, explaining how to do it for yourself. insights for the advanced as well." Ian Young bonsaieejit.com : "The book is named as a sequel to his first publication but can be read as a stand-alone book in its own right. As good as the original was, it is obvious that Harry has listened to the bonsai community and made a few changes to improve his second offering. The quality of the photography has improved and with a better quality paper the images just bounce out of the page. All the charm of the original is still there. We still see trees that everyone can aspire too, as opposed to the usual books full of bonsai that most of us can never dream of collecting or expect to afford. We see that material, given time and the right care and treatment can make respectable bonsai. I fully expect this to be just as big a success as Bonsai Inspirations 1." The new book of the English Bonsai´s master Harry Harrington reinforces the feeling of his first book. Bonsai Inspirations 2 is, again, a lesson about how to develop bonsai trees without being afraid of the ancient rules or traditions that most of the time stops enthusiasts creating their own trees. Mr. Harrington shows in this new book some of the necessary techniques in an easy and clear way. How to develop trunks, roots, branches etc with plenty of pictures and drawings. This second book talks in the direct way of Mr Harrington about very interesting species such as the European Larch or the Cotoneaster, not usually used as matter of study in the bonsai scene. The author does that, again, showing us the evolution of his own collection of bonsai, from a simple sapling to the final part, a bonsai ready for exhibition. If you liked Bonsai Inspirations 1, you will enjoy the number 2, because it's as useful and interesting as the previous one, but even better! The title ‘Bonsai inspirations’ says it, it inspires you, believe me! I received a preview and first looked at the content page. There are many different subjects, from developing bonsai from various stages like air-layering, field-grown etc., to techniques used for bonsai. This is all inserted between the beautiful progressions in boxes with ‘theory’ about the techniques used on the tree. I think this is a good way to explain the techniques, because the ‘theory’ is spread over the book. What I also like about the book is that this book is for both beginners and experts. Everything is explained very well, like one time I was reading the progression of a Lime tree, the tree was defoliated just 6 weeks after repotting and I thought: “why would you do that, that’s not good for the tree?”, when I continued reading, there was a note that this tree was vigorous enough to do that. It’s almost like it stood there specially for me! The choice of the lay-out as well for the other pictures in the book was a good choice. I think you can even understand the progressions if you can’t speak English by just looking at the pictures, the pictures for the book are chosen with great care!